Coming (Lord's return) - (cf 1 Thes 1:10), 1 Thes 2:19, 1 Th 3:13, 1 Th 4:15, 1 Th 5:23 - Reference to the Lord's return is in every chapter indicating that this is a major underlying theme of Paul's letter to the believers in Thessalonica. As an aside, many are surprised to discover that allusions (direct and indirect) to the Lord Jesus' return are common in the New Testament and in fact are found in about 1 of every 20 NT verses. Clearly the Second Coming is a major emphasis of the NT, even as the more than 300 Old Testament Messianic prophecies point to His first coming. Why this emphasis? Clearly the Spirit (Whose role is to glorify the Lord Jesus) desires that believers of all ages fix their eyes on the things above, eagerly, expectantly looking for the Lord's return (cf 1 Th 1:10+) to take us to our true, eternal home. You can mark the principle down that what (Who) you are looking for will radically impact what (Who) you are living for! If you are looking for Jesus to come at any time (see Imminent/Imminency), you will living for Jesus ALL THE TIME! How are you doing beloved child of the Living God (1 Th 1:4+), disciple of the Lord Jesus Christ? No "guilt trip" intended, but if you are not living in light of eternity today, confess it to your Father in Heaven, repent and set out on your new journey which will radically impact your future in eternity. See R C Sproul's Right Now Counts Forever (and video) and on site discussion of why you need to Redeem the Time. How do I apply this? - Do you ever feel as though your Christian faith has grown stale, that you are withering on the vine when you would rather be flourishing in His service? Paul’s first letter to the Thessalonians is the perfect remedy for such a feeling. Its focus on Christ’s return provides water for the thirsty soul today, encouraging growth in maturity by providing hope in the midst of suffering or uncertainty. Paul’s specific, practical instruction for this process of sanctification can be applied directly to our current circumstances. By clinging to our hope in Christ, we may see several clear results in our lives: avoiding sexual immorality, refusing to defraud others, appreciating those Christians who serve on your behalf, refusing to repay evil for evil, rejoicing always, praying without ceasing, and giving thanks in all things—to name a few (1 Thessalonians 4:3–7; 5:12–23). This list, of course, is not exhaustive, but the first letter to the Thessalonians makes clear that every Christian should expect to grow in holiness over the course of his or her life. Paul and those who received his epistles believed in one living God (1 Th 1:9), the Father (2 Th 1:2), who has loved men and has chosen them to enjoy his salvation (2 Th 2:16;1 Th 1:4). He has sent deliverance form wrath through Jesus Christ, his Son (1 Th 1:10), and has revealed this deliverance through the message of the gospel (1 Th 1:5; 2:9; 2 Th 2:14). This message has been confirmed and has been made real by the power of the Holy Spirit (1 Th 1:5; 4:8). The gospel concerns the Lord Jesus Christ, who was killed by the Jews (1 Th 2:15). He rose from the dead (1 Th 1:10; 4:14; 5:10). He is now in heaven (1 Th 1:10), but he will come again (1 Th 2:19; 4:15; 5:23; 2 Th 2:1). To him is ascribed deity, for he is called Lord (1 Th 1:6), God’s Son (1 Th 1:10), and the Lord Jesus Christ (1 Th 1:1, 3; 5:28; 2 Th 1:1). Believers receiving the word of God (1 Th 1:6), turn from idols, serve God and wait for the return of Christ (1 Th 1:9, 10). Their normal growth is sanctification (1 Th 4:3, 7; 2 Th 2:13). In personal life they are to be clean (1 Th 4:4-6), industrious (1 Th 4:11, 12), prayerful (1 Th 5:17), cheerful (1 Th 5:16). Theoretically and practically the Thessalonian letters embody all the essentials of Christian truth." Background and Setting - Thessalonica (modern Salonica) lies near the ancient site of Therma on the Thermaic Gulf at the northern reaches of the Aegean Sea. This city became the capital of Macedonia (ca. 168 B.C.) and enjoyed the status of a “free city” which was ruled by its own citizenry (Acts 17:6) under the Roman Empire. Because it was located on the main east-west highway, Via Egnatia, Thessalonica served as the hub of political and commercial activity in Macedonia, and became known as “the mother of all Macedonia.” The population in Paul’s day reached 200,000 people. Paul had originally traveled 100 mi. from Philippi via Amphipolis and Apollonia to Thessalonica on his second missionary journey (A.D. 50; Acts 16:1–18:22). As his custom was upon arrival, he sought out the synagogue in which to teach the local Jews the gospel (Acts 17:1,2). On that occasion, he dialogued with them from the OT concerning Christ’s death and resurrection in order to prove that Jesus of Nazareth was truly the promised Messiah (Acts 17:2,3). Some Jews believed and soon after, Hellenistic proselytes and some wealthy women of the community also were converted (Acts 17:4). Mentioned among these new believers were Jason (Acts 17:5), Gaius (Acts 19:29), Aristarchus (Acts 20:4), and Segundus (Acts 20:4). Because of their effective ministry, the Jews had Paul’s team evicted from the city (Acts 17:5–9), so they went south to evangelize Berea (Acts 17:10). There Paul had a similar experience to Thessalonica with conversions followed by hostility, so the believers sent Paul away. He headed for Athens, while Silvanus and Timothy remained in Berea (Acts 17:11–14). They rejoined Paul in Athens (cf. Acts 17:15,16 with 3:1), from which Timothy was later dispatched back to Thessalonica (3:2). Apparently, Silas afterwards traveled from Athens to Philippi while Paul journeyed on alone to Corinth (Acts 18:1). It was after Timothy and Silvanus rejoined Paul in Corinth (Acts 18:5), that he wrote 1 Thessalonians in response to Timothy’s good report of the church. 1 Thessalonians 1 - Lesson 5- Flee from the Wrath that is to Come! Charles Haddon Spurgeon (see his comments in following entry on Alford). Editorial Note: If you are not proficient in Greek, you will find this work considerably more useful than the following work by Alford, because in this volume he translates the Greek and Latin into English. While the "The Greek New Testament" is longer (e.g., English version of 1John = 66 pages compared to Greek version = 94 pages in part because the latter includes comments of more technical nature), the substance of the commentary is otherwise similar to that found in the "NT for English Readers". Henry Alford's "The New Testament for English Readers"
John Piper writes ""When I’m stumped with a… grammatical or syntactical or logical [question] in Paul, I go to Henry Alford. Henry Alford… comes closer more consistently than any other human commentator to asking my kinds of questions." Henry Alford's 1903 "The Greek Testament"
1 Thessalonians 4:9-12 Now, Do More! 1 Thessalonians - Pdf - 271 page commentary - highly recommended - he has frequent quotes from other conservative evangelical authors, as well as devotional questions to help apply the text to your life. THEME: The return of Jesus Christ. In I Thessalonians every chapter ends with a reference to the second coming (1Th 1:10; 2:19-20; 3:11-13; 4:13-18; 5:23, 24). 1. Some of the believers had stopped working and abandoned their responsibilities to await the Second Coming with a kind of hysterical expectancy. Paul corrects their misconceptions (1Th 4:11). 2. They were worried about those who had died and Christ had not returned. Paul gives them courage and hope in their bereavement (1Th 4:13-18). 3. There was a tendency to despise authority (1Th 5:12-14). 4. These were converted pagans who had come out of heathen vices, and it was easy for them to fall back into immorality (1Th 4:3-8). 5. As all ways there was a small group who slandered Paul and said the only reason he preached was to get what he could out of it (1Th 2:5, 9). Some accused him of being a dictator (1Th 2:6, 7, 11). 6. There was some division in the church (1Th 4:9; 5:13). 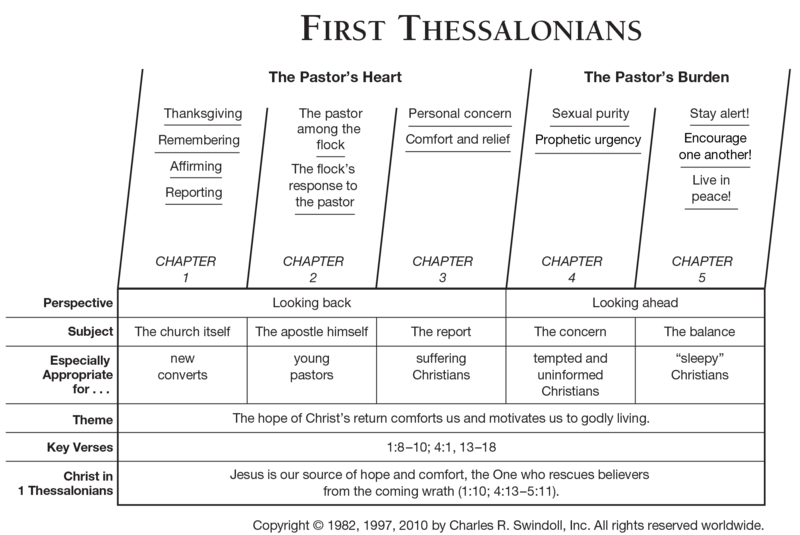 Second Thessalonians was written within a few weeks of the first letter. The second letter was written to clear up a misconception about the Second Coming. There were certain signs that would come before Christ's appearance. The two letters would give balance to the thinking about the Second Coming. COMING––parousia––means "presence" or "arrival" of persons or things (1 Cor. 16:17; 2 Cor. 7:7; Phil. 2:12; 2 Cor. 10:10). It designated the royal visit of an emperor, king, a governor, ruler or famous person. For such visits special preparations had to be made. Taxes were imposed to present the king with a golden crown. All things must be made ready for the visit of the king. Provinces were dated as a new era of time from the parousia of the emperor. It was common to strike new coins to commemorate the visit of a king. The coming of the king brought a new set of values. The word is used to describe the entrance of a new conquering power and the visitation of a god. The day is coming when the King of Kings will come and reign with all of His gory and power. Preparations must be made (1 Thess. 3:13; 5:23;1 Jn. 2:28). The same Jesus who ascended to heaven will come again to visit the earth in personal presence (Acts 1:11) at the end of the age (Mat. 24:3) in power of glory (Mat. 24:27) to destroy the antichrist and evil (2 Thess. 2:8), to raise the righteous dead (I Cor. 15:23), and to gather the redeemed (Mat. 24:3, 27, 37, 39; Jn. 5:28, 29; 1Th 2:19; 3:13; 4:15; 5:23; 2 Thess. 2:1, 8, 9; Jas. 5:7, 8; 2 Pet. 1:16; 3:4, 12; 1 Jn. 2:28). Parousia is the time when the Lord shall come out of heaven (1 Thess. 4:15; 1:10). At that moment the dead who are believers will rise first, and those who are believers and are alive will be changed and be caught up in the air by Jesus Christ. DAY OF THE LORD –– is an Old Testament expression meaning a day when God will personally intervene and bring salvation and judgment. In the New Testament it is related to the Second Coming of Christ (1 Cor. 1:8; 5:5; Phil. 1:6, 10; 2:16; 2 Thess. 2:2). This is not a twenty-four day, but a period of extended time during which the judgments of the Lord Jesus Christ will take place upon the earth. For the believer it is salvation, for the unbelieving world it is a day of judgment and tribulation. .
James Rosscup: This is a lucid and well-organized exposition of the epistles with many helpful lists on different facets of truth John can have in mind at different points as on “light” and “darkness” in I John 1:5. There is stimulating background material and warm application. (Commentaries for Biblical Expositors: An annotated bibliography of selected works). D Edmond Hiebert - Prints the author's own translation. A series of popular studies whose strong point is word study. Contains good illustrative material. Part of the author's interpretation follows a liberal position. Barclay holds that Christ's descent into Hades gave those who there heard Him a second chance. Comment: I appreciate Barclay's unique insights on Greek words, but clearly his teaching about a "second chance" is NOT sound doctrine! Be an Acts 17:11 Berean with Barclay. See discussion of his orthodoxy especially the article "The Enigmatic William Barclay". F W Farrar writes that Bengel's "Gnomon is a mine of priceless gems. It contains sentence after sentence exquisitely terse and finished, and throbbing with spiritual light. Few writers have so admirably succeeded in expressing in a few words the inmost purpose of each of the Epistles. A generation crowded with writers whose theology abounded in mutual anathemas is yet redeemed from the charge of sterility which has produced such a theologian as Bengel. His work must continue to have its value so long as men can recognise the richest fruits of a noble intellect, a pure spirit, and a blameless life. "Lord Jesus, unto Thee I live, unto Thee I suffer, unto Thee I die; Thine I am, living or dying." These words were repeated to him in his last moments, and on hearing them he pointed with his right hand to his heart, and fell asleep in peace." (Amen!) (History of Interpretation: Eight Lectures Preached Before the University of Oxford in the Year 1885). John Wesley said of Bengel "I know of no commentator on the Bible equal to Bengel" and referred to him as "The great light of the Christian world." Spurgeon - Adopted by the Wesleyan Conference as a standard work, and characterized by that body as marked by “solid learning, soundness of theological opinion, and an edifying attention to experimental and practical religion. Necessary to Methodist Students. Spurgeon - We liked Burkitt better when we were younger. 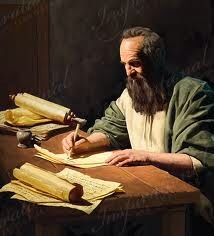 He is, however, a homely and spiritual writer, and his work is good reading for the many. Burkitt is somewhat pithy, and for a modern rather rich and racy, but he is far from deep, and is frequently common-place. I liked him well enough till I had read abler works and grown older. Some books grow upon us as we read and re-read them, but Burkitt does not. Yet so far from depreciating the good man, I should be sorry to have missed his acquaintance, and would bespeak for him your attentive perusal. James Rosscup - Calvin was not only a great theologian but also a great expositor, and his insight into Scripture contributed to his grasp of doctrinal truth. His commentaries are deep in spiritual understanding, usually helpful on problem passages, and refreshing in a devotional sense to the really interested reader. He usually offers good help on a passage. The present work skips Judges, Ruth, Samuel, Kings, Chronicles, Ezra, Nehemiah, Esther, Job, Ecclesiastes, Song of Solomon, II and III John and Revelation. Calvin is amillennial on long-range prophecy, but in other respects usually has very contributive perception on passages and doctrinal values edifying to the believer. He also can be very wordy, but the serious and patient glean much. D Edmond Hiebert - Valuable for insights into Reformation day views. James Rosscup - This old, conservative Wesleyan Methodist work is good devotionally and aggressive for righteous living. Laypeople can find it still valuable today. It is Arminian in viewpoint and thus helpful, for example, in showing the reader how this approach deals with texts involving the eternal security question. The work contains much background material from many sources on all books of the Bible. (1906) "Designed for Pastors and Sunday Schools"
D Edmond Hiebert - A vigorous and informative homiletical exposition by a noted Scottish theologian of the past generation. Cyril Barber - It is generally inferior to Milligan and cannot hope to compete with Hiebert’s masterful study. Eadie is worth checking - you have to "wade" through his lengthy, "Greek rich" comments but will often uncover some excellent insights. Cyril Barber - Readers may not always agree with his exegesis, but he does provide a helpful evaluation of all the different points of view with an assessment of the strengths and weaknesses. An essay on “The Man of Sin” is appended. D Edmond Hiebert - Greek text. First published in 1861, this noted, scholarly, highly technical treatment of these epistles is still of value for the advanced student. Places strong emphasis on grammatical matters. 1 Thessalonians 4:1-12 hat Is Your Goal In Life? 1 Thessalonians 4:13-18 What Hope Do You Have? James Rosscup - Gill (1697–1771), a pastor of England, wrote these which are two-column pages, ca. 900–1,000 pages per volume, Originally they were 9 volumes, folio. He also wrote Body of Divinity, 3 volumes, and several other volumes. His commentary is evangelical, wrestles with texts, is often wordy and not to the point but with worthy things for the patient who follow the ponderous detail and fish out slowly what his interpretation of a text is. He feels the thousand years in Revelation 20 cannot begin until after the conversion of the Jews and the bringing in of the fullness of the Gentiles and destruction of all antiChristian powers (volume 6, p. 1063) but in an amillennial sense of new heavens and new earth coming right after Christ’s second advent (1064–65), and the literal thousand years of binding at the same time. He feels the group that gathers against the holy city at the end of the thousand years is the resurrected wicked dead from the four quarters of the earth (i.e. from all the earth, etc. (1067). Spurgeon - Beyond all controversy, Gill was one of the most able Hebraists of his day, and in other matters no mean proficient...His ultraism is discarded, but his learning is respected: the world and the church take leave to question his dogmatism, but they both bow before his erudition. Probably no man since Gill’s days has at all equalled him in the matter of Rabbinical learning. He preached in the same church as C. H. Spurgeon over one hundred years earlier. Yet most people today have never heard of John Gill. This is unfortunate, since his works contain priceless gems of information that are found nowhere except in the ancient writings of the Jews. Spurgeon - A Christian man wishing for the cream of expository writers could not make a better purchase. Ministers, as a rule, should not buy condensations, but get the works themselves. James Rosscup - This evangelical work, devotional in character, has been in constant demand for about 280 years. Its insight into human problems is great, but it often does not deal adequately with problems in the text. The one-volume form eliminates the Biblical text and is thus less bulky. It has sold very well. The late Wilbur M. Smith, internationally noted Bible teacher, seminary professor and lover of books, tabbed this “The greatest devotional commentary ever written”. Henry was born in a Welch farmhouse, studied law, and became a Presbyterian minister near London. He wrote this commentary in the last 13 years before he died at 52 in 1714. The first of six volumes was published in 1708. He completed through Acts, and the rest of the New Testament was done by 14 clergymen. (Ed: Thus James are not the comments of Matthew Henry). John Cereghin - . Popular expositions. He urges the joy of soulwinning (14); stressses the enabling power of God (34); teaches unlimited redemption in Christ (55); emphasizes that only God can qualify men for the ministry (73); attacks Theosophy, Seventh Day Adventism, Christian Science (103); warns against the "social gospel" (111): holds that the Sermon on the Mount is for all believers (139); warns against evolution (155). James Rosscup - He is staunchly evangelical, showing good broad surveys based on diligent study, practical turns, even choice illustrations. In prophecy he is premillennial dispensational....Many preachers have found that Ironside works, read along with heavier books on details of exegesis, help them see the sweep of the message and prime their spirits for practical relevance. Rosscup - This is a helpful old set of 1863 for laypeople and pastors to have because it usually comments at least to some degree on problems. Though terse, it provides something good on almost any passage, phrase by phrase and is to some degree critical in nature. It is evangelical. There is also a 1-volume edition, briefer at some points (Grand Rapids: Zondervan, 1961). Especially in its multi-volume form this is one of the old evangelical works that offers fairly solid though brief help on many verses. Spurgeon said, “It contains so great a variety of information that if a man had no other exposition he would find himself at no great loss if he possessed this and used it diligently” (Commenting and Commentaries, p. 3). Things have changed greatly since this assessment! It is primarily of help to pastors and lay people looking for quick, though usually somewhat knowledgeable treatments on verses. Spurgeon - A really standard work. We consult it continually, and with growing interest. Mr. Fausset’s portion strikes us as being of the highest order. My Comment - This is one of the best older (Pre-1800) works on interpretation of prophecy as it tends to interpret the text literally and not allegorically. One of the best Plymouth Brethren writers. D Edmond Hiebert - A full, vigorous interpretation with a clear Plymouth Brethren emphasis. John Cereghin - A careful exposition by a voluminous Plymouth Brethren scholar of the 19th century. D Edmond Hiebert - Valuable textual exegesis with an abundance of ethical, homiletical, and practical material added, much of which is definitely dated. A conservative Lutheran commentary. The additions by the translator add to the value of the work. 1 Thessalonians 5:12-28 What Distinguishes Believers from Those in Darkness? Functions like a Verse by Verse Expositional Commentary. Recommended Resource. 1 Thessalonians 4:3 Why Does Paul Link Sanctification With Sexual Immorality? 1 Thessalonians 4:11 How Do Ambition and Quiet Living Fit Together? 1 Thessalonians 5 Pray Without Ceasing . . . Really? 1 Thessalonians 5 Can We Really Pray Without Ceasing? 1 Thessalonians 5:9-11 Will Believers Suffer Through the Tribulation? D. Edmond Hiebert - A thorough exposition of these epistles by a scholarly German professor of the past century. One of the justly celebrated older commentaries, with ample presentation of varying views on all important points. Dated but still of value for those familiar with the Greek or desiring the views of scholars of the past. D. Edmond Hiebert - Greek text. A noted critical study by a pioneer authority in the papyri Has much valuable material in the introduction and the added notes. “Christianity Under Claudius,” Bulletin of the John Rylands Library 44 (March 1962): 309-326. 1 Thessalonians 4:4: Breaking the Impasse," Bulletin for Biblical Research 11.1 (2001): 65-105. Exposition of 1 Thessalonians 4:13-18," Irish Biblical Studies 1.3 (July 1979): 150-156. Arguing About the Rapture: Who Must Prove What and How? Rev 11:15, 1 Cor 15:52, 1 Th 4:16 s the last trumpet of 1 Thessalonians 4 the same as the seventh trumpet of Revelation? 1 Thessalonians 5:22 What does it mean not to give the appearance of evil? 1 Thessalonians 4:13-18 What is the difference between the Rapture and the Second Coming? How can I be ready to be caught up in the rapture? How can I be sure I won’t be left behind in the rapture? Who are the dead in Christ in 1 Thessalonians 4:16? 1 Thessalonians 5:2 What is the day of the Lord? 1 Thessalonians 5:18 Why is giving thanks to God important? A E KNOCH - conservative, literal, discussions vary from 4 pages to more than 20 pages depending on length of the book. 1 Thessalonians 1:10 The Only Deliverer from the Wrath to Come! 1 Thessalonians 1:10 What would the damned in hell give, for one hour's sleep! 1 Thessalonians 4:3 Is God's Will My Will? 1 Thessalonians 4:3 Do You Walk In White? 1 Thessalonians 4:13-18 He's Coming, Are You Going? 1 Thessalonians 4:17 and the Meaning of “to Meet”: “Meeting the Dignitary” or “Retrieving the Bride”? 1 Thes 1:8: How Will They Hear? 1 Thes 1:8: What A Ride! 1 Thes 1:9-10: Do You Have Hope? 1 Thes 1:1-10: How Will They Hear? 1 Thes 2:4: What Motivates Us? 1 Thes 2:8: What is This About? 1 Thes 2:19: That's My Pay! 1 Thes 4: Are You Ready? 1 Thes 4:1: Is Ambition Wrong? 1 Thes 4:1-12 How Was I To Know? 1 Thessalonians 4:1-12 Keep Climbing! 1 Thes 4:13 The Land of "What Is"
1 Thes 4:13-18: What's Ahead? 1 Thes 4:13-18: Be Careful, He's Coming! 1 Thes 4:13-5:11: He's Coming! 1 Thes 4:16: How Would You Answer? D Edmond Hiebert - While not as full as the author's excellent work on the Gospel of Luke, these volumes provide a critical exegetical unfolding of these epistles. Greek words are often quoted but generally in parentheses, so that the non-Greek reader can readily profit from these volumes. Recommended. Biblically sound and very practical with emphasis on application. 1 Thessalonians 1:3-5 Insurance or Assurance? 1 Thessalonians 4:13-16 Will Believers Go Through the Tribulation Period? 1 Thessalonians 2:17-20 Is It Worth It? The following topics are all on this page. 1 Thessalonians 2:1-12: Whatever Became of Integrity? Prayer: Why Should We Pray? Body and Soul in the Bible: What Am I? The Dean of Modern Prophecy Commentators. 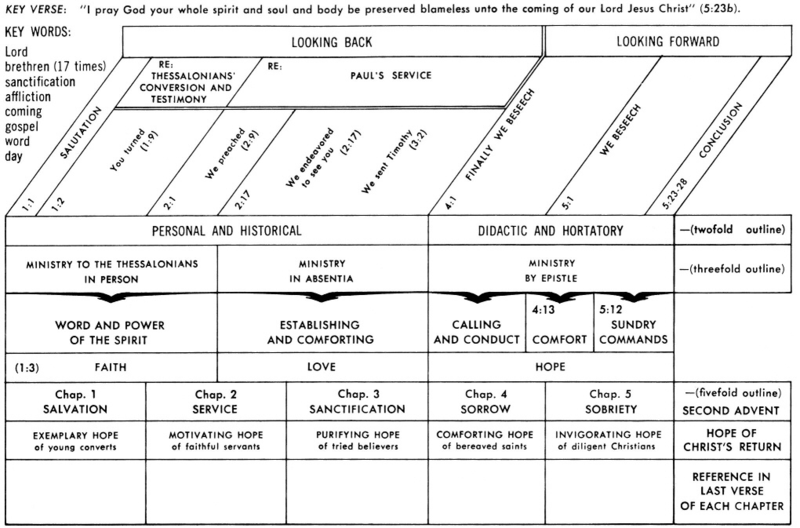 Dispensational. Be A Berean - He is Amillenial. 1Thessalonians 1:1-3 Introduction - "Paul Greets The Thessalonians"
1Thessalonians 1:4-6 - "Even In Affliction, We Can Know The Joy Of The Lord"
1Thessalonians 1:7-10 - "Does The Word Of The Lord Sound Forth From You?" 1Thessalonians 2:1-4 - "Men Pleaser's, or God Pleaser's? Let's Speak The Truth In Love"
1Thessalonians 2:5-8 - "Give God's Truth, Together With Your Life That Shows That Truth"
1Thessalonians 2:9-12 - "Walk In A Manner Worthy Of The God Who Called You"
1Thessalonians 2:13-16 - "Suffering: The Servant Is Not Above His Master"
1Thessalonians 2:17-20 - "Our Hope, Our Joy, Our Lord Jesus!" 1Thessalonians 3:1-5 - "God's Word Establishes And Encourages Us In Our Faith"
1Thessalonians 3:6-10 - "Paul Is Encouraged By The Steadfastness Of Their Faith"
1Thessalonians 3:11-13 - "May The Lord Cause You To Increase And Abound In Love"
1Thessalonians 4:1-3a - "Strive To Be A Theologian"
1Thessalonians 4:3a - "Sanctification Must Follow Justification"
1Thessalonians 4:3b-8 - "It Is God's Will That You Should Be Sanctified"
1Thessalonians 4:9-12 - "Live A Brotherly And Orderly Life"
1Thessalonians 4:13-14 - "Our Hope Is In Christ For Today and Tomorrow"
1Thessalonians 4:15-18 - "The Rapture Of The Church"
1 Thessalonians 4:13-18 Is Death's Separation Permanent?